I really enjoy being in Brighton. Brighton is a different culture, it’s much more relaxed and as a student it’s great. The support structure on the maths course is so nice, there is an open door policy which means I can go to my tutors and they are always willing to help. 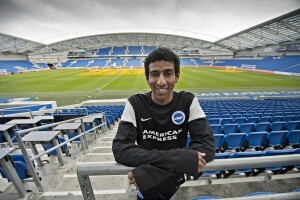 I did my placement at Albion in the Community, Brighton and Hove Albion. I love the diverse nature of the job and the fact that I’m not just sitting behind a desk inputting numbers. Working with coaching groups on the programmes organised by this charity has solidified my direction after graduation – I would like to use my knowledge of maths to help people: as a teacher or in a more analytical role. This entry was posted in Placements, Uncategorized, Undergraduate.